The lyric "Off we go into the wild blue yonder" from "The U.S. Air Force"
Into the Wild Green Yonder, sometimes incorrectly known as The Wild Green Yonder, is the fourth direct-to-DVD film. It was released on 23 February, 2009 in Europe, on 24 February, 2009 in the USA and on 4 March, 2009 in Australia on DVD and Blu-ray. Guest stars include Penn & Teller, Snoop Dogg, Seth MacFarlane and Phil Hendrie. The distraught staff of Planet Express arrive in the desert to begin searching for Bender's remains. They quickly find them as Bender and Fanny aren't dead, because the whole ordeal was purely a warning. At Wongminster, Leo's miniature golf club, Leo is playing a round with Fry, Amy and Leela. Leela complains about the club's no-girl policy, and about Leo's treatment of nature and animals. Meanwhile Leo is tired of one aspect of miniature golf: that it is so damn miniature. Therefore, he has begun constructing the universe's biggest miniature golf course. He shows them the first tee, where a cannon launches a giant ball from Mars to Pluto's moon, Hydra. Leo plans to destroy 12% of the galaxy to build the course, and has hired Farnsworth to perform a environmental survey of the affected spiral arm. With the survey in progress, Farnsworth explains why a regular sized miniature golf course simply isn't enough for men, because all men do is take other stuff and make it bigger; he illustrates the point by showing off his 301 inch Megaphallix TV but, to his discontent, a 302 Megaphallix inch model is advertised. As the Planet Express Ship arrives in the violet dwarf system, the machine discovers life on an asteroid — the intended site for the 18th hole, as well as the golf pants museum. Despite the clear signs of life, Farnsworth decides to approve for demolition, clearly keen on receiving his bribe. At the golf course, Earth president Nixon and his vice-president, the Headless body of Agnew, are playing with Leo. 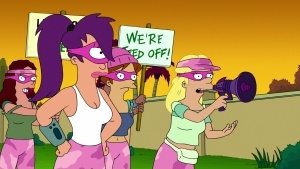 They are interrupted by the Feministas (now joined by Leela), who have arrived to protest the construction of the golf course. As Agnew attempts to capture the protesters, a run-away golf cart runs him over and he is pronounced dead. In a speech to the planet, Nixon is not pleased with the death of his vice-president; he declares the Feministas outlaws. In their hideout, the Feministas decide to move up from simple protesting to actual sabotage. Wong has sent a ship to sweep up the rings of Saturn, but the Feministas easily sabotage it by pouring sugar in the fuel tank and shoving an organic potato in the tailpipe. To increase their public image, Leela decides to use her muck leech as their mascot. As Fry wanders New New York's streets after Leela's departure, he runs into Hutch again. Hutch whacks him on the head and they enter a mysterious glowing dumpster. Hutch reveals that he is a member of the Legion of Mad Fellows. Their leader, the Number 9 Man, explains to Fry how life originally started with the Chi spreading across the universe, but for reasons unknown, the Chi began to recede. Which meant the diversity of lifeforms across the universe began to decrease. However, the knowledge of these former species was retained by the Legion of Mad Fellows, who passed the knowledge on through the ages. However, recently, the Chi has begun to reform, and the asteroid in the violet dwarf system holds the key to the enlightenment of a new green age, and Fry's purpose is to become a shepherd and protector of it, because he lacks the Delta Brain Wave. His task is to stop Leo Wong in his goal to construct his miniature golf course. So Fry gets himself hired as a security guard at Wongminster. Meanwhile, the Feministas are sabotaging the King Kong hole by ripping the green off its asteroid, destroying the course. On Channel √2 News, this is the top story. Linda is not pleased that Morbo always gets the top stories. In a breaking story, the Feministas have sent a tape out with a warning to Leo Wong and a call for support from the public. After the broadcast, Linda joins them. Leo asks Nixon for help with the threat presented by the group, and Nixon sends Zapp Brannigan on the mission to stop the group. Bender joins Zapp's mission. 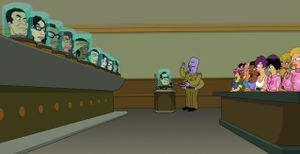 In order to receive a large payment, Bender has supplied Zapp with information about the identities of the Feministas. Bender has a plan to capture their leader, Leela, by wire-tapping Fry's mobile phone. 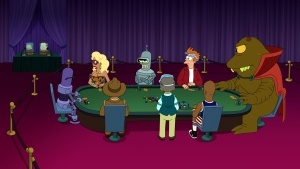 At the construction site, Bender obtains Fry's phone, while Fry is debating with Leo and Amy. Amy is confused how Fry can be friends with Leela, yet work with Leo, and Leo cannot stop making quips about Amy's physical appearance. In disgust, Amy leaves to join the Feministas. Later, while closing up the golf course, Fry runs into Frida. Fry asks her to tell Leela that he is really on their side. At Planet Express, Farnsworth announces that, having lost their delivery crew and with sales of Tickle Me Bender dolls declining, he is forced to close the business forever - again. He removes Hermes's and Dr. Zoidberg's career chips. However, a phone call from Leo Wong puts them back in business again. Leo has hired them to set up a fence to keep out the Feministas while he is destroys the violet dwarf star. However, before they can set up the fence, they are boarded by the Feministas, who take over the ship and paint it pink. Using the fence, the women capture Leo and Inez Wong. Back at their hideout, Frida is writing up new slogans, while thinking about what Fry told her to say. But one of the Dark Ones is nearby and reads her thoughts. Since Frida does not know who Fry is, the Dark One kills her. Near Wongminster, Fry runs into Hutch again, who brings him back to the Legion in a different hideout, which is the former city of the Native Martians. Number 9 Man tells him about two ancient species, one snakelike and one froglike, which at one time co-operated to get food, but later began an Arms Race of Evolution. One of them later became the Dark Ones, a species which preys on other lifeforms, and destroyed one entire species after another. The other species became the Encyclopods, defenders of all other lifeforms, who collect DNA from endangered species which they could then use to recreate extinct species. The Feministas return to their hideout, keeping Farnsworth, Hermes and Zoidberg locked up. To their horror, they find Frida is dead. Leela calls Fry to prove to Amy that he is not helping Leo Wong destroy the violet dwarf. 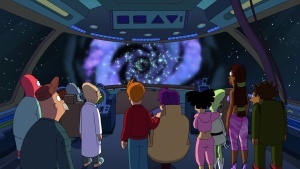 Fry learns that the Encyclopods have died out after the Chi declined, but have left an egg behind – the violet dwarf star – which the Legion hope to hatch. However, a Dark One is on its way to the egg to ensure its destruction and the Legion does not know what they look like. Despite this, the Dark One's thoughts would be unreadable, allowing the Legion to discover the Dark One via their absence of thought. The members of the Legion cannot look for the Dark One, however, because their tin foil hats do not work at close range to the Dark Ones (which would thus reveal their plan once in close proximity to them); since Fry's brain cannot be read by anyone, he is the only one with a chance. Interrupting, Fry's phone rings. Leela and Fry decide to meet. 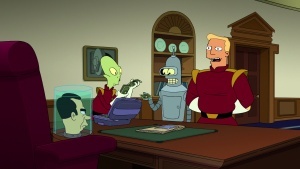 However, the wire-tapping of Fry's phone pays off, because Zapp and Bender are listening in on the conversation. Zapp tells Kif to set co-ordinates for Leela (apparently, which is her measurements, 36-24-36). At the Keeler Crater, the Nimbus infiltrates the meeting, but the Planet Express ship piloted by the Feministas arrives to save them. The chase between the Nimbus and Feministas begins. Amy plans to lose them through the giant miniature golf course. At the windmill hole, Zapp's carelessness gets the Nimbus sliced in half by the wings of the mill, causing the loss of all his men. Despite the crippled Nimbus, the chase continues to the King Kong hole. The Nimbus is further damaged as a result of a bad shot through the gorilla. Zapp orders the ship repaired and thus cancels the chase. The hole for the tee, however, is a wormhole, and the Planet Express ship emerges from the other side of the hole near the Nimbus, and they have moved forward enough in time that Nimbus is already repaired and so the chase is back on. While slowing down near the violet dwarf star without fuel, the Nimbus finally catches up with and arrests them. At the Earth Supreme Court, the Feministas stand trial by the court lead by Snoop Dogg's head. The Feministas are charged for several crimes, including protecting the environment. Nixon, Bender, Fry and Leo Wong are witnesses at the trial. The vote by the judges is 5-4 to acquit. However, the female judges' votes only count half, and so it is 4-2.5 to convict. The Feministas are sentenced to Maxi-Padlock, a high security women's prison. And with the group gone, Leo schedules the demolition for the next day. Fry is unsure what to do, so he seeks out the Legion again. The Number 9 Man explains that Fry has to stop the Dark One from stopping him stopping Leo Wong, and in order to do that, he needs the Omega Device. The device, when activated, will momentarily disable the Dark One, giving Fry a chance to stop it. However, to recognize the Dark One, Fry has to come up with a plan himself, Hutch explains that its thoughts are unreadable, which gives Fry an idea. At Maxi-Padlock, the group is planning an escape, Leela attempts to get the muck leech to crave its way through the walls. Back at Planet Express, Zoidberg and Scruffy have finished repainting the ship back to its original green colour, while Farnsworth and Hermes have been watching the news about the arrest on the new MagnaPhallix 304". Farnsworth has still not been convinced to do something about getting the crew back. The muck leech has failed, but Bender breaks the Feministas out instead. Bender explains that this allows him to commit 50 felonies at once by breaking them out, putting his score way above theirs. At the violet dwarf star, Leo has gathered a large crowd to overlook the demolition. Meanwhile, the escape from the prison is successful with the Planet Express ship arriving just in the nick of time. The rest of the staff has decided to help the group. Farnsworth explains his discontent with living with the thought that he got bribed and misused his position as a scientist. At the gathering, Fry searches unsuccessfully for a person whose thoughts he cannot read, who must be the Dark One. Fry remembers that his own thoughts cannot be read, and concludes that he must be the Dark One himself. The Planet Express ship arrives to interrupt the countdown. Despite their efforts, Leela gives back the detonator to Fry, and he uses it straight away. Fry had secretly connected the wire to the Omega Device. The device has no effect on Fry; the muck leech is revealed as the last of the Dark Ones. While he is disabled, the asteroids in the star system form into the shape of a sperm, with the life-filled asteroid as its head; they float into the star, which begins dividing like an embryo, ultimately developing into an Encyclopod. As the Encyclopod speaks, Leela asks what's going on, and as Hutch begins to tell her, he is attacked by the Dark One. As he dies he sees Frida's necklace stuck in Fry's brain, and removes it. The Encyclopod destroys the Dark One and preserves the DNA of Homo sapiens. Fry is confused, because he thought it only saved the DNA of endangered species. The Encyclopod flies off without explanation. Zapp resumes his pursuit of Leela and the Feministas. As the crew approaches a worm hole, Leela finally admits to loving Fry. With little time, the crew agrees the only way to go now is in to the worm hole. Into The Wild Green Yonder. Ken Keeler wrote the episode "The Devil's Hands Are Idle Playthings", the final episode of Futurama's original run. 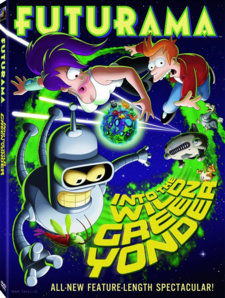 As Into the Wild Green Yonder was perceived as possibly the last ever film/episode the writers got to do with Futurama, they also wanted to make this a memorable one, and thus Ken Keeler was chosen as its main writer. Originally, the Mars Vegas segment wasn't supposed to last as long as it did (that equal of an episode length), but since they liked the setting so much, the writers extended the setting for one fourth of the film, where some of the plot, which originally intended to develop on Earth, simply occurred on Mars. The subplot with Bender and Fanny was also extended because of this change. Ken Keeler had originally written a lot more lines between Bender and Donbot, in the awkward shots between him, Donbot and Fanny. Into the Wild Green Yonder was supposed to be the "classic science-fiction story" of the four films, with Bender's Big Score being the "time-travel epic", The Beast with a Billion Backs being the "monster film" and Bender's Game being the "fantasy film". As a classic science-fiction story, Into the Wild Green Yonder focuses on an ancient war between two equally ancient species, which subsequently gains new weight as our own main characters enter the ordeal. This film was subject to censorship by itself. "Into the Wild Green Yonder Part 4" was subject to censorship by Pick TV. See Miscellany of Into the Wild Green Yonder for trivia, quotes, etc. For a list of people appearing at the audience scene at the end of the film, see Audience scene. An unnamed easter egg that shows what Zapp Braniggan was saying in his speech during the scene where Fry is trying to discover the dark one. The Region B version of this disc has a slightly different cover design. ^ Commentary for "The Devil's Hands Are Idle Playthings" on Volume Four, disc 4. ^ Commentary for Into the Wild Green Yonder on the DVD. ^ a b Cohen, David. Commentary for Into the Wild Green Yonder on the DVD. ^ Commentary for The Beast with a Billion Backs on the DVD. This page was last edited on 3 September 2015, at 21:22.